We are a leading Service Provider of bulk email from New Delhi, India. 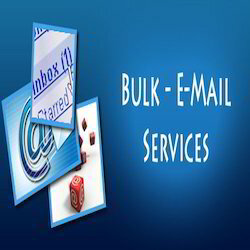 Being a quality conscious organization, we are actively committed towards offering professionally managed Bulk Email. Mass email marketing is the best way to avoid the high cost of printing and postal cost of traditional direct mail and it is more effective. A mass emailing campaign will often turn a profit even if the entire mass email list campaign produces only 1 percent response rate. We hold expertise in offering these services with great efficiency and accuracy. Clients can avail these services from us at pocket friendly prices.